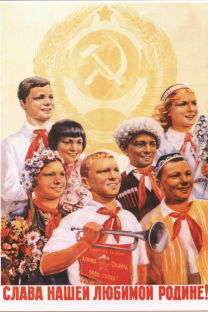 Soviet poster: "Glory to our beloved motherland"
Now that it has been 20 years since the collapse of the Soviet Union, it is once again in vogue to talk about how terrible a system it was. I wonder the extent to which this mindset is a product of western-controlled media. I don’t want to debate the differences between pure textbook communism and what Stalinism turned out to be. I also don’t want to disregard the atrocities that were committed. But what I do want to do is revisit some of the things we owe the USSR, but never acknowledge. 1. Women's rights: While some islands had granted women the right to vote even in the 19th century, the first major wave came in early 20th century. By 1917, only four major countries – Australia, Finland, Norway and Denmark – had moved to women’s suffrage. The 1917 Russian Revolution, advocating equal rights for all, raised the fear that feminists would find a communist system more appealing, and may conspire with the Bolsheviks to import it into Western countries. The best way to nip such a threat in its bud was to grant women the right to vote. Britain and Germany allowed this in 1918, the United States followed in 1920, and others shortly took their lead. France was the only major power to not grant this right till 1944. 3. The Second World War and Post-War Reconstruction: The USSR played a phenomenal role in defeating Nazi Germany; Stalingrad is the famous battleground that thwarted the Blitzkrieg and reversed the tide of the war. The USSR lost 23.4 million people – that’s more than deaths in Nazi Germany, and it is over 26 times the human loss suffered by the US and UK combined. Once the war was over, the Marshall Plan was created because the western Allied countries did not want Europe to succumb to communism in the face of death, hunger and devastation. In fact, the Plan was extended only under the condition that communists will be ousted from aid-receiving countries’ parliaments. So much for democracy, eh! 4. The Anti-Colonial Drive: While imperialism fed western industrialist and capitalist machines, the USSR championed the cause of the exploited colonies. It extended aid to both countries fighting for their liberation and newly-independent states. The Indian freedom struggle’s Soviet leanings are no secret; for a poor country striving to find its feet on the ground, the communist ideology was naturally compelling. 5. Scientific discoveries: The Soviets launched the first ever satellite, and later sent the first dog, man, and woman to Space. They also developed various television designs. In short, there would be no Tata Sky had the Soviets not done their magic. Other than that the Soviets also take credit for artificial organs, the first helicopter, electrophotography, and the infamous AK-47. When I discuss some of these things with my Russian friends, they stress that USSR’s positive impact comes not from it being a good system but because of its “scarecrow” way of affecting change. There is definitely truth in that point of view but it is equally important to be intellectually honest and give credit where it is due, even if it’s just this once.